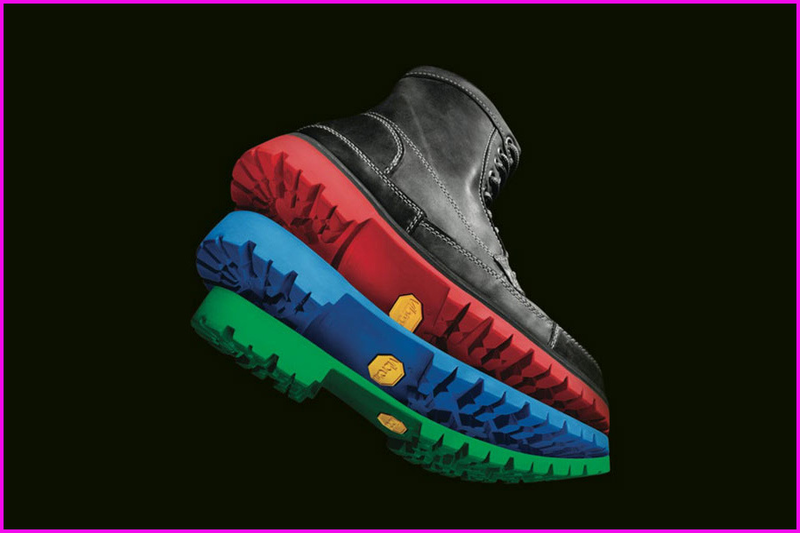 Check out the Vibram Sole Factor to get some re-treads on your favorite Ked’s, Jordans, Brogues, Sandles or Boots. You select your sole, send in your shoes, they re-sole them for you and send them back in the mail. Pretty awesome! Prices start at $75. And not only do they have the Red, Blue and Green pictured above. They have Lime, Orange, White, Grey, Black, Red, White and Blue Camo, Blue and White Camo, Brown Camo and a few other nice selections. These durable custom soles come in various widths too. Check out their site for the deets. There’s even a pair of Cons on there, that look pretty sweet with a brand new thick, chunky white new sole. Nice Punk-Rock Lookity Look. See you on the Streetz this weekend at the Lovefest, Janet Jackson Concert and the new Bloomingdale’s in HI. Enjoy the newest of the new Star Wars Trailer below. Me, I can’t wait for the final Mockingjay movie, but as you may know, I’m leaving the theatre 10 minutes before it’s over. I read the book! As some may know, I’m presently on a clothes and shoes fast until the end of September. For a bit, I was quite upset and didn’t write for a week or so, but I’ve decided even on a fast, I can still look and write about what I find. I found the most amazing shoes on instagram! The Greenwich Vintage Co. When I first saw these I was pretty upset because they were so nice,but only 25 available. I thought, On a shoe fast what am I going to do? Greenwich Vintage x Color of Life ‘Grown Man Solar Reds’ from Greenwich Vintage on Vimeo. And the prices seem reasonable, I haven’t checked the details on the shipping costs, but the prices start at just $275 for these super slick custom kicks! 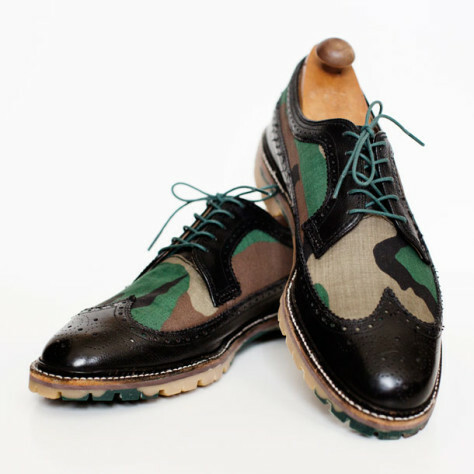 *The black and Brown start at $275, camo’s are a tad more. If you aren’t ready for the full-blown custom experience or want to save a bit of cash, you can grab a pair of your own shoes, choose a flashy sole, mail them to these guys and they’ll trick them out for you. 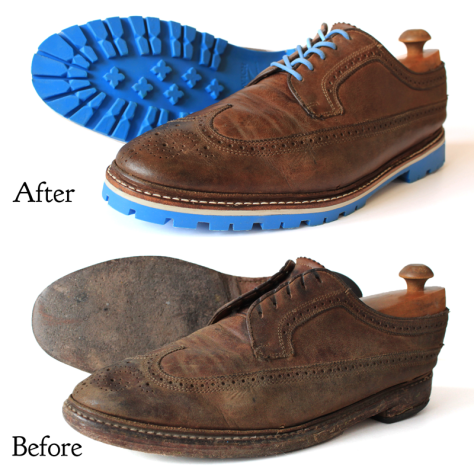 Before and After pictures of older shoes with bright new blue soles! Or the third option, is to choose a pre-made pair of iconic colorways. As of today, there are 4 to choose from. 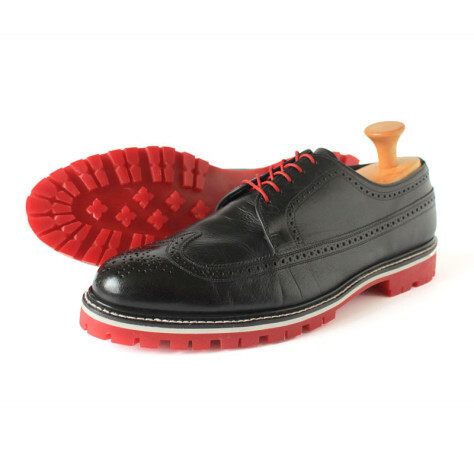 Here’s a picture of one of the HOT options in black with red soles. Me, when I get a pair, I’m for sure going for the custom-built to order pair. Maybe, by the time my clothes and shoe fast is done, they’ll have a pair of hi-top built to orders. That’s a good thing about clothes and shoe fasts, is things can get better as time goes by. I may miss out on the special 25 pairs, but I’ll be ready in October for some of my own specially made custom-built to order kicks from the Greenwich Vintage Shoe Company. Greenwich Vintage’s primary focus is the re-crafting and re-purposing of wingtips, boots and chukkas with its signature in-house colored soles. In addition, the Company resoles and restores customers’ footwear with its signature colored soles, preserving and improving on the past for future generations. Greenwich Vintage takes pride in being keepers of the craft, in that all of our in-house footwear is designed and handcrafted by our master cobbler at our workshop in Waconia, Minnesota. Finally, Greenwich Vintage is proud of the fact that all of our products, from footwear with colored soles, clothing, as well as accessories, are MADE in AMERICA. Color Your Sole from Bolster on Vimeo. You know, being on a clothes and shoe fast isn’t all that bad, it gives me a chance to search the condo for some special kicks. In the place I live, it’s almost like real shopping. Yesterday I found and wore some Green, white and Gold retro Lebrons. I received a bunch of compliments at the gym and many people had never even seen them before! See you on the streets of Oahu all week-long and at the Spartan Race on Saturday and Sunday August 16 and 17, 2014. I’ll probably be wearing some nice retro J’s or Lebrons in the Mud, some would say I’m crazy, but those are about the only shoes I have to choose from! Hot as Nails..Hot off the Press! These look so slick and cool and Hot and your nails can’t get too much more down with the Street lookin’ than this . This YouTube video from cute nails shows you a simple step by step process to get this super customizable look. And it looks just as cool using magazines-I’ve seen some nice nails using the National Enquirer, the paper quality is similar to newsprint, thus it works perfectly. If you try it, leave some pictures down below for us to see. I can’t believe something so simple to do, can make something as awesome as these customized nails. I bet with a couple of friends help, I could set up a pop shop for a month or two and make some good money doing this for people, it would be like a Tattoo shop for nails-Waikiki Here I come..of course with some helpers. For Custom Tattoo’s Check out my friends Lee, Ryson and Tyler over at Bespoke Custom Tattoo on Keeaumoku across street from Sam’s club near Ala Moana in Honolulu, HI. For Custom Rhinestone Gear check out my friend Thomas at broke2 gear. For Custom Kicks I recommend NikeID or if you go to New York, stop by the Converse Store in NOHO-they have free iPads to use with tons of custom designs to choose from and the store is totally lots of fun just to hang out in! If you’d like to, leave a comment below and let me know your favorite Custom brick and mortar store, website, idea, invention, that’s going down in your City or somewhere you’ve traveled. Random Thought for today after watching the Fuse Much Music Video Awards Show: Hey-How come Avril Lavine has looked the same age for the last 12 years? What is up with that? She doesn’t even have one single wrinkle. Un Real ..eh? The premiere of the new season of “Breaking Bad” starts this Sunday/tonight on AMC. The previews are looking pretty Killer! and show 4 of True Blood is on Sunday on HBO. Great time for good shows there aren’t many sports being played right now on TV.